Back in 2013, I rode in the Pyrenees and the Alps, with Mont Ventoux in between. While stages 1-9 were all in unfamiliar territory too, they were flat! 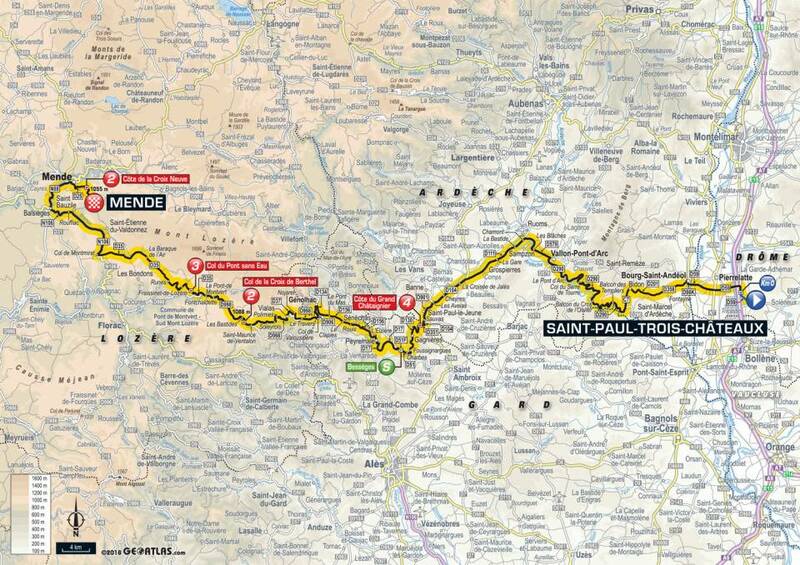 I've been looking forward to these hills in the Massif Central since the route was announced. 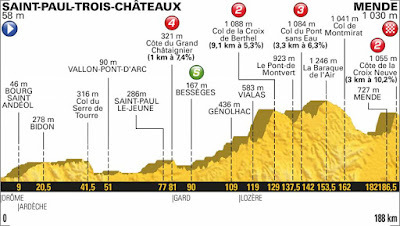 We had a relatively short drive this morning, and were on the road before the women - a rare occurrence (if not unique). Unfortunately, dinner last night was also pretty short, and breakfast this morning too, and I felt very flat for the first few hours of the ride. In our start-line briefing, Jonathan had described the first 80km as flat, which was not quite true, but it was certainly beautiful. 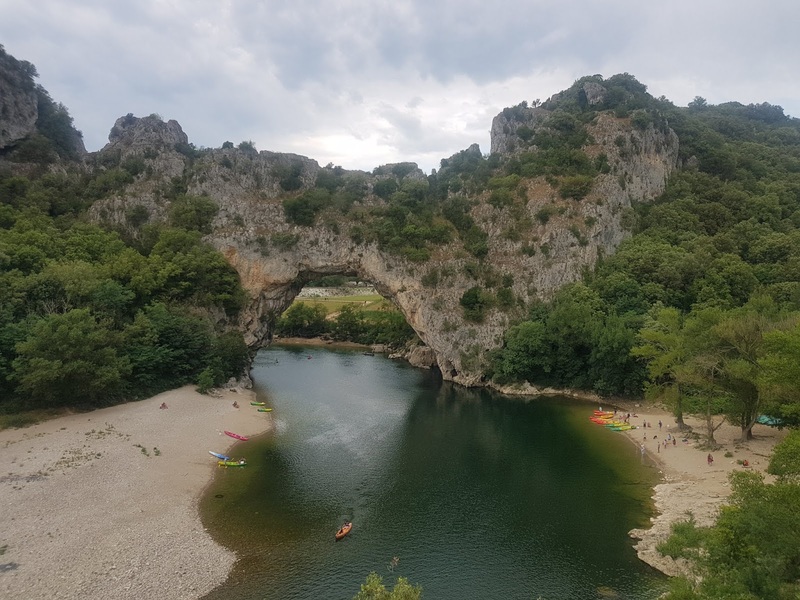 I was initially disappointed when the route went the opposite direction to a sign indicating the "Des Gorges de l'Ardeche", but instead of taking the road through the gorge, we were first afforded great views of it from above. Eventually, the road dropped down to the river, and we were soon at the Pont d'Arc. I couldn't help but stop and lift my bike over a wee wall to photograph it. As I commented to Julie later on, this blog has been an awesome motivator for such moments - without it, I probably would have made do with the pass at 30km/h. The gorge wasn't done with us yet, and we had a couple of nifty tunnels to pass through. An earlier one on the descent had been fairly long. Rather than install lights, they'd just dynamited a hole in the wall at around the half way mark! We had our first feed at the 83km mark, which was probably too late given the route, and the previous night's dinner. I filled my belly though, and hoped to goodness that my legs would wake soon after. The support crew do a fantastic job with these - once we've set off, they go to a nearby supermarket and get supplies for the day. Then set up bike racks, seats and tables, and make sandwiches and all manner of other goodies. 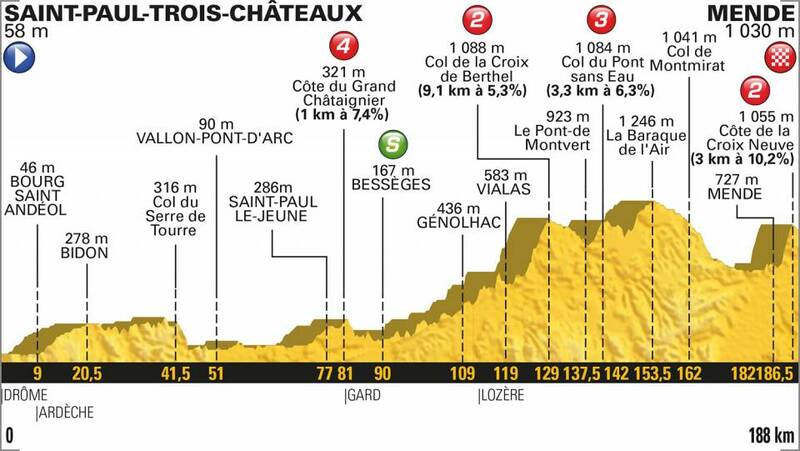 We had a short descent, and then got into the day's long climb up to the Col de la Croix de Berthel - part of it gets a Cat.2 rating for tomorrow's race, but we ascended almost 1000m in the space of 40km. The climb was lovely and mellow, but it was also stinking hot. To make matters worse, every stream we crossed was either bone dry, or would be a battle to get to. 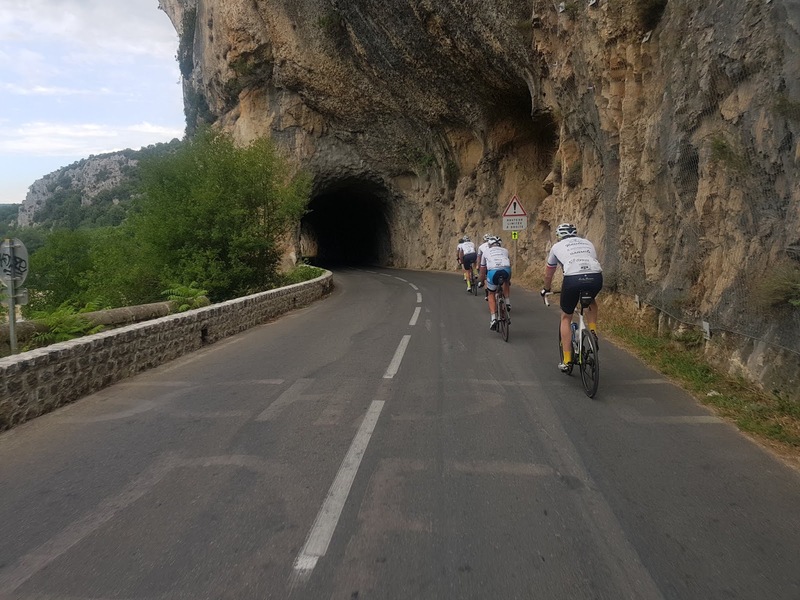 Poor Stu overheated again, as he'd done on Alpe d'Huez, but luckily by the time this had happened, my morning tea had well and truly kicked in, and I was able to offer him some much needed help. Things got pretty grim at one point, but banging him in the van with the air conditioning on seemed to help a lot. Once over the Col, we regrouped, and decided that Mike, Paul and I would ride with Stu, and the others would go ahead. The temperature had dropped about 10 degrees too, which was great. 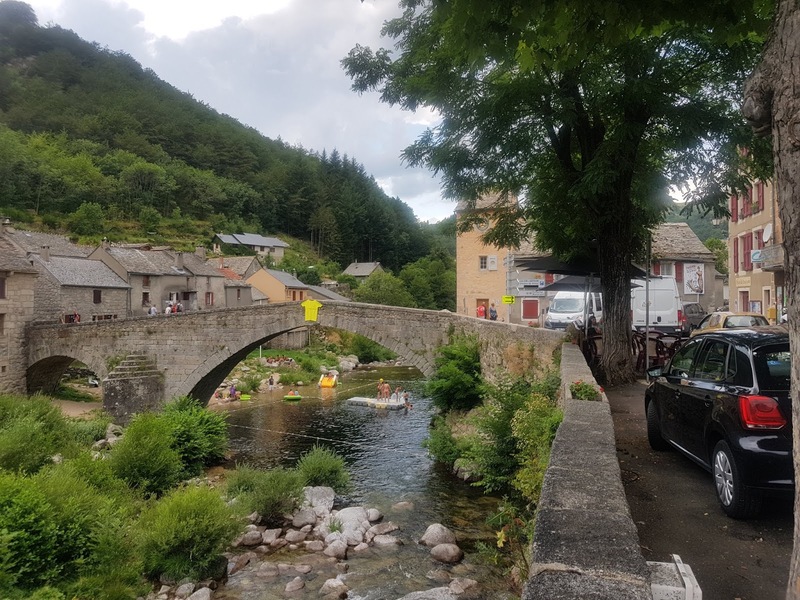 Once we set off, we passed through a couple of neat villages, which seemed a bit more lively than many that we ride through, wondering where everyone is! 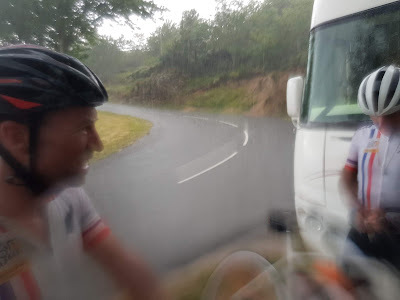 After sweltering our way up the main climb, and being unable to find any water to cool ourselves, it was terribly ironic that not only did the temperature drop on the down hill, but it also started raining - for the first time in over 2000km! It was strange rain too - the rain drops were few, but huge, and we were quickly drenched. Before we were done with the next small rise, the rain intensified (so the huge drops were now plentiful), and when we were blasted with hail, decided to cower under a tree... A few tour fans in the attendant camper van hardly seemed to notice us, with their focus on a packet of chocolate biscuits instead. 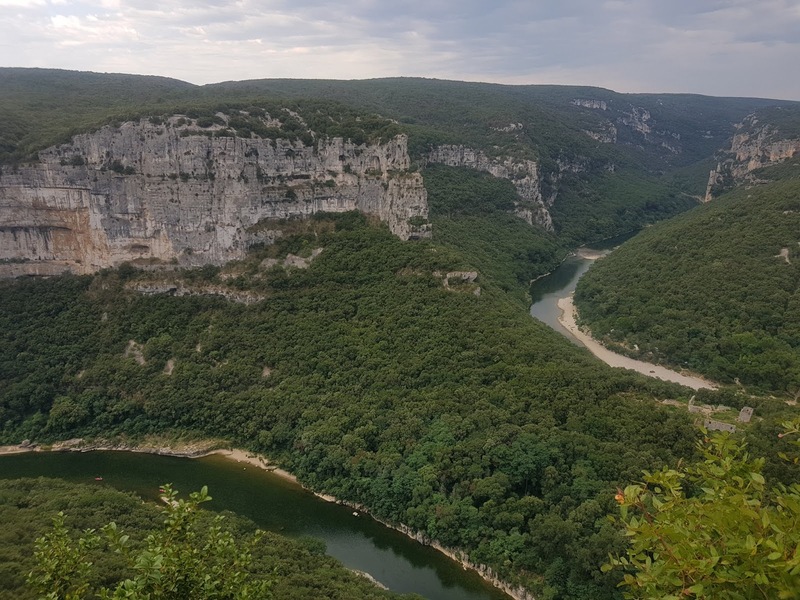 Stu had done well over two of the three remaining climbs, but on the long descent into Mende, the temperature began to rise again, and by the time we were at the base of the final pinch, he was on the ropes. Bill had driven to the top, and ridden back towards us, and he and I were able to give Stu the wee boost he desperately needed. The climb was pretty nasty, with at least one 500m stretch averaging over 13% - to keep on top of my gearing, I had to go pretty hard, and had the horrible metallic taste of my legs in my mouth when we finished. 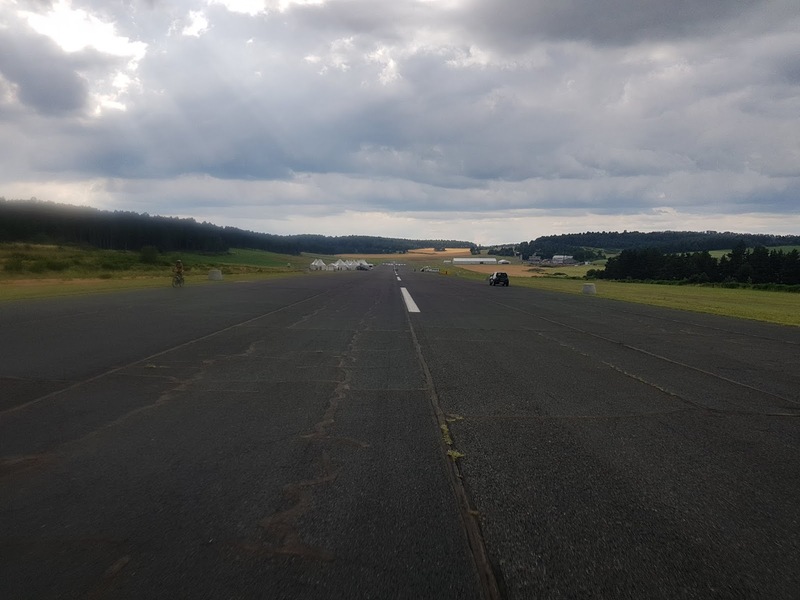 Before handing my bike over to Roger, I decided to go check out the airstrip - used as the finish straight the last time the tour came up, but not in use this time, apart from being a handy parking space. I rode to the far end in the normal fashion, but on the way back down, rode with my arms outstretched - pretending I was a plane was a nice way to finish the ride. Strava: 193km covered in 9h30, 3100m ascended, including a couple of Cat.2 climbs. 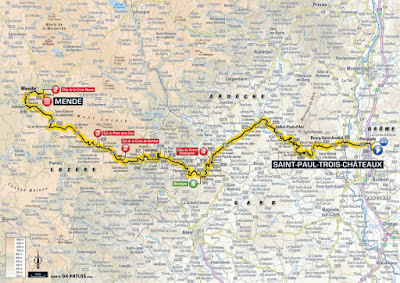 Tomorrow, Stage 15 into Carcassonne, and then a much needed rest day (during which I hope to get a haircut, and watch the big boys ride). For now, join me in hoping that Stu sleeps well, and shakes off this issue with the heat. He's been as solid as a rock until now, and is a wonderful man, and it's horrible to see him suffering in this heat. 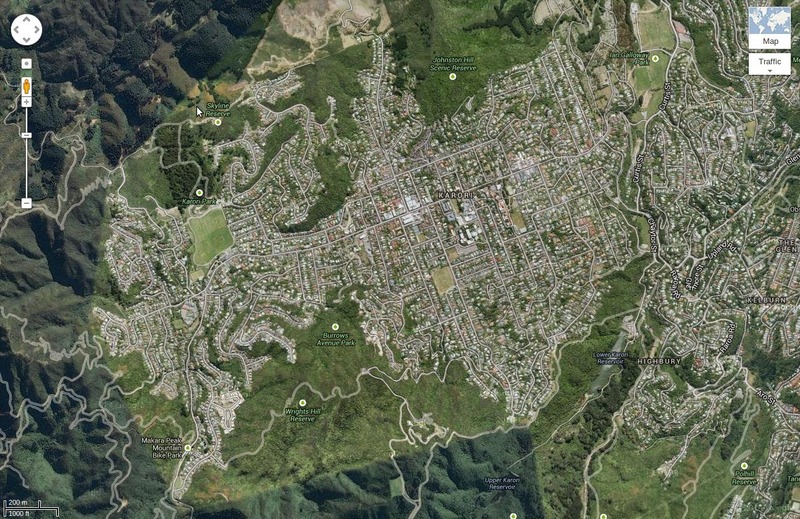 This blog describes a fundraising project for the Mental Health Foundation of New Zealand. Nearly 50% of New Zealanders will experience a mental health problem in their lifetime, and one in five will have experienced a mental illness this year. Depression is set to overcome heart disease as the biggest global health burden by 2020. The Mental Health Foundation (MHF) is a charity that works towards reducing stigma and discrimination associated with mental illness. We provide free support, training, and resources for anyone who is going through a difficult time, or for people who are supporting loved ones. To make a donation, visit https://events.mentalhealth.org.nz/fundraisers/sifter. Any contribution, big or small is greatly appreciated, and will be put to good use by the fine folk at MHF.